Lex looks out the window with a, "huh." "Where's Gaspar when you need him?" "I 'ave no clue what zat is." The Frenchman said. "Zat could be ze Vitesse brozers running in tandem circles, or Skew wiz a portal to a wind-swept desert... I do not know. Back to ze school as quick as we can. "Fluxx encourages. Feel free to have know-it-all Jay recall the info, his big-brain and Eidetic recall would have surmised the meaning of Haboob easily and the info was already shared with him. "Rheid, we still need Dr Talley. Can you find her?" "Martin's" actions didn't provide a clue as to his true identity, so Violet needed to probe further. "Martin, where's Tatjana? Miss Catargi said she's missing." Kas scowled at the notion yet another threat had appeared before the first had been dealt with, but there was nothing to be done about it. Still, he almost lost control when Emily projected her visual input into his mind. He really wished telepaths would quit doing that. He had been without sight for years and the sudden influx of visual data was disorienting. He just wasn't used to perceiving the world that way anymore. He also had to bite back a vitriolic response to Prodigy's exhortation for him to get them to the school. They were flying at 250mph, which for a group of people unfamiliar with guiding their own aerial path, was probably pushing the envelope of safety as it was. "We'll be at the school any moment now." He answered grimly. Seems like a good place to wrap Lex for this session, Arkrite. The next session will pick up right here. A haboob is a dust storm that plagues the Sahara region, Prodigy said across their telepathic link. It's likely this is the work of the gentleman we saw in Martin's memories, which would mean that these people have undoubtedly decided to use the mages' attack to their advantage, striking while we're at our weakest. And this seems like a good place to stop for Martin and Kas for this session. We'll pick it up next session with them arriving at the school. Rheid nodded before hurrying out of the room, leaving Shiver alone with Fluxx. "Martin, where's Tatjana? Miss Catargi said she's missing." Tallemaja hesitated. Not even an hour ago, Martin had come to Dag's room, and told her of Tatjana's fate: "Bad men are planning to attack ze school and 'ave taken Tatjana wiz ze conditions zat I not warn ze school or it's affiliates." Would she be jeopardizing Tatjana's safety if she relayed what she knew? "She's waiting for me to come and rescue 'er," the faux Martin said. "Beatrice will be fine wiz rest. I need to go, Violet. I 'ave to go and save ze day." Unless you have other intentions, Shock, I'll have Tallemaja phase out of the room, and we can wrap this scene and move to the next session. Gwyn felt odd about Mezzanine. Something squiffy about her. "Flippin perfick, that is. How worse?" He asked the hundreds-year old man. Newton regarded Blue Knight calmly. "Several attacks-"
"Others are coming," Mezzanine said, interrupting him. "It may be prudent to not repeat yourself, and wait for the others to arrive." Newton sighed, begged the boys to forgive him, and proceeded to do the one thing he did not want to do now: wait. If you both are cool, I'll move forward and kick off the next session? "Is that everyone?" Newton asked when Shiver slipped into the room. "We're still missing Lex," Kirstie insisted. Right on cue, Lex and Catargi entered the room. At the first sign of him, Kirstie grabbed his face, pulled his lips to hers, and kissed him urgently. "Don't you ever do that to me again," she commanded once she pulled away. The headmaster looked out over the students, and allowed a mournful sigh to escape his lips. "This city needs saving, and it appears fate designs to make you her saviors. As you all know, reports of skeleton armies, as well as giant skeletons, have come in from the city. We now know that this is the work of a group of mages--two of which are still at large. "The Vindicators engaged these mages, and as a result, Quintessence, Backlash, and Hubris are currently missing. Before Pict, Kiln, and Fey could move to rescue their teammates, however, several other situations have arisen. At present, we do not know if these attacks on Vienna are being staged by the surviving two mages, allies of theirs we did not know about, or--quite simply--another group looking to take advantage of the situation we were initially put in. "What we do know is that there are seven--seven reports of attacks across the city." Behind him, the air displayed a map of Vienna, showing the school, and the site of each attack. "We'll start with the closest one to us: the Prater. Dispatch has picked up distress calls about a giant monster rampaging there. "At Stephansplatz, cameras are rolling." The map changed then, showing footage from the scene: several buildings had collapsed; some were even being swallowed by the earth itself. "There are people trapped, and we've no idea what caused this disaster. The map returned then, highlighting the northern most location. "Allgemeines Krankenhaus is the site of the next attack. Emergency calls from Vienna General Hospital suggest that they are under attack by a Neo-Sapien who is specifically targeting health care workers. Many doctors and nurses have fled, for fear they'll be this madman's next victims. As such, there are few left to tend to the patients housed there... and that number is steadily decreasing as this man finds them. "All it takes to see what is happening at Josefstadt is a look out the window. 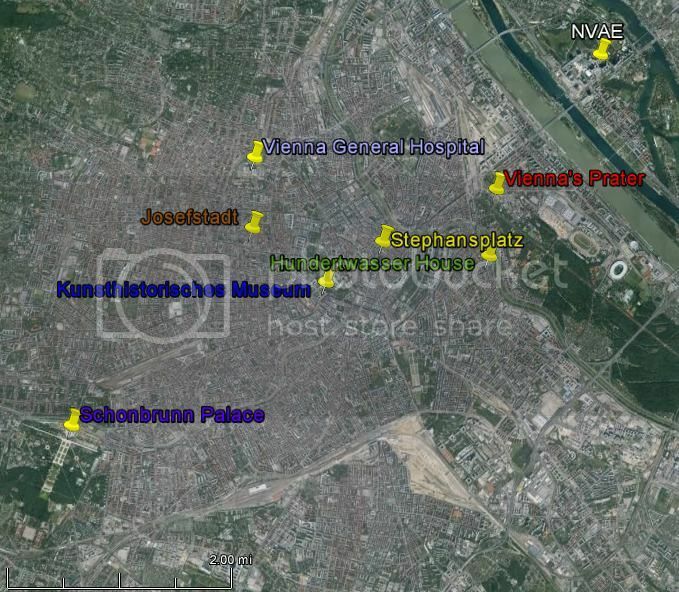 That area of Vienna has been devoured by an enormous dust storm. Those who escape this catastrophe have not been able to give us much more information as to what is happening inside." Newton flashed up an image of a building. "This is Hundertwasser House then... and this is it as of a few minutes ago." The image changed then, showing what looked like a lush jungle. "This area of town has been overrun with plants--some carnivorous. Others... unnaturally hostile." The map returned then, showing one of the two locations furthest out. "We've gotten report that a pair of Neo-Sapiens are attacking Kunsthistorisches Museum. Two men. No description beyond 'highly aggressive'. "Finally, Schönbrunn Palace... This one is a low priority for us, but a big one for the higher ups. Apparently, anything of value is disappearing at an alarming rate. "Even at their full capacity, the Vindicators could not hope to put out so many fires at once. That is why I'm asking you all--any of you who are brave enough, and capable enough... to lend this city your strength. I hate myself for asking you to risk your lives in this manner, but I fear what will happen if we do nothing." The headmaster bowed to the student body. "Please," he begged, "your city needs you." It is 9:00 AM. Time is currently counting. It is assumed that prior to this briefing, Martin would have healed Kiln and Fey. Hero points are reset. One hero point to everyone for railroading them all into this scene. From the last session... power point to Magnitude, Blue Knight, and Shiver. They were the ones who primarily found themselves in combat, and are the ones who need the most catching up to Current, Fluxx, and Greystone. I hope that's all right with everyone. Fluxx (he was in uniform), had been going around and dematerializing any plants in the room it was the same trick the Curies used to store cell phones and such by breaking them into their component parts and just storing their patterns for later rematerialization. His sister (under the control of Lacuna) showed him the trick. He also blacks the windows with a film of carbon. As an added precaution he asks Catalyst to connect the minds of everyone here, Tantivy, if she's in range, a mage named Gwen, and, if she could find her, Tallemaja. He steps up to call their attention. ~I can only pray my telling you zis does not sign Tatjana's deaz warrant.~ He let the gravity of those words sink in before continuing. ~Robor is an Irishman wiz a black shillelagh, I zink he could control plants like our Randy.~ Fluxx will send mental images of these people as he describes them, along with their scent for any who could recognize such. ~Last, is Ogre. Incongruously, by process of elimination, I believe it eizer to 'be' or 'be controlled by' a girl in her late twenties. She was a waif, and clad in a bodysuit similar to ze Vindicators’ uniforms.~ He especially send that picture along. Last edited by flynnarrel; 09-24-2014 at 09:37 PM. Catalyst reached out with her mind and connected as many minds as she could. Lex's mind was unreachable to her, as was Tallemaja's. Similarly, Tantivy resisted the connection. I can only pray my telling you zis does not sign Tatjana's deaz warrant, Fluxx thought, but I do not zink she would like it if I let you all go out wizout being fully prepared. Rembrandt, from what I know of ze man was ze same. I know of zis new group. Zey are a consortium of mercenaries 'ired by Siegfried Völsunga, President of Völsunga Enterprises, and zeir ultimate aim is to attack and kill someone at zis school, which makes zese 'distractions' no less dangerous or credible zreats. That would be me, Newton announced. He looked visibly shaken. Potentially Mister Bottom, as well. I doubt it, though: Mister Bottom has not been nearly as public about his presence here as I have. Siegfried is an man who feels cursed by his own immortality, and blames the meddling of other immortals for the pain he has endured. He seeks to stop men like myself from interfering in the lives of mortals by permanently ending our existence. Rest assured, he has the capabilities to do so. Those brought down by Siegfried do not cheat death. Thank you, Martin. If he is the one behind this, then there is no need to ask any of you to do anything. Doctor Fischer, please contain all students and faculty members inside of the Wreck Room. Transparent walls formed around everyone. Mezzanine immediately shut herself down. "If Siegfried is attacking this city to draw me out, then it seems there is only one course of action that can be taken. Just as I was prepared to ask you children to sacrifice anything to save this city, so am I. It was an honor serving you, and I wish you nothing but many, many years of happiness." With that, the headmaster turned, and left the Wreck Room, determined to sacrifice himself to save the city.